14. To the Nation Remonstrate, and the Persecution of Matsuba Valley. Moonlight lighted up the small hermitage of Nichiren. The disciples were fast asleep. Nichiren slept a comfortable sleep temporarily for the sense of accomplishment that accomplished the protest to a ruler. There was not yet the reaction of the 'Treatise of Establishing the Correct Teachings for the Safety of the Nation'. Had Tokiyori Hojo read my treatise? There are no notices. If Tokiyori was a benevolent lord, there is something surely. He must answer with persecution if foolish. “Rationale will win in the times of wise King. The unjust precedes the times of the foolish ruler. Understand the true doctrines of the Lotus Sutra appear in the times of the saint”. ’On the opening of the eyes’. Was Nichiren able to really meet Tokiyori Hojo? Nichiren writes down in "the writings which interviewed the deceased Saimyoji Nyudo" which were jotted down in 1269 in this way. 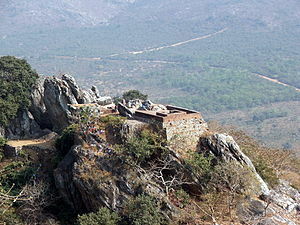 “Because the [Zen] Buddhism temples intended to let people abandon the faiths of old temples [Lotus Sutra temples such as Enryakuji Temple] all together in Japan, I told the deceased Saimyoji Nyudo about this at the time of interview with the reason that it was the fault of the evil spirit. Furthermore, he wrote it in 'About Having to Say the Doctrine" in December 1270 either. “I said to the deceased Saimyoji Nyudo. ‘The Zen Buddhism is an act of the evil spirit’. I told this by the treatise of protest later and informed him”. Nichiren strengthened blame and wrote it particularly in the treatise for Nembutsu which spread among the common people in four sects of "Ritsu, Nembutsu, Zen, Shingon", but Zen Buddhism was believed among samurais generally. Therefore, blame for the Zen Buddhism is thought to have spoken frankly daringly when he met Tokiyori of the leader of the samurai. 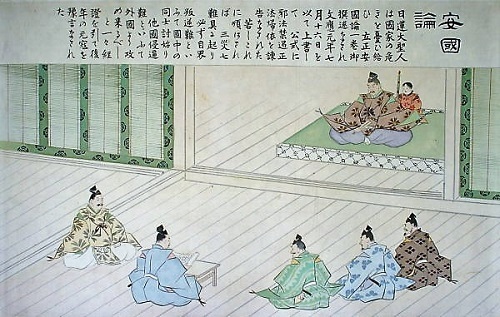 The persons that Nichiren made an effort for an interview of Tokiyori are thought to be Mitsunori Yadoya who passed on the treatize to Tokiyori from Nichiren as the commissioner of Shrines and temples, and Daigaku Saburo who was Shogunate official of Confucianist converted to Nichiren immediately after founded the sect. When Nichiren gives to the deceased Saimyoji Nyudo the treatise, he is said to have shown it beforehand to Daigaku Saburo. In addition, Mitsunori Yadoya will be converted to Nichiren from the magical opportunity of the presentation of the treatise. In any case Nichiren achieved responsibility as a votary of the Lotus Sutra, and the feeling of satisfaction that accomplished the caveat to the nation was deep. It is said that the person who does not tell a ruler it while one knows the disobeying to teachings falls into the dungeon of the hell of incessant sufferings with a bad person. However, the result of the warning to nation became, 'the unjust precedes the times of the foolish ruler'. In addition, the populace of Kamakura becomes like this later as follows in "Letter to the lay priest Nakaoki" which Nichiren wrote down. “At first, when I alone chanted the daimoku, those who saw me, run across me, or heard me covered their ears, glared at me with furious eyes, contorted their mouths, clenched their fists, and ground their teeth. Even my parents, brothers, teachers, and friends became my enemies. Then the land steward and the lord of the manor where I was residing turned against me. The whole country made a fuss later, and all the people were surprised after”. 'Letter to the Lay Priest Nakaoki'. Nichiren came home from Iwamoto Jitsusoji Temple of Suruga with Hokibo who just joined him. Disciples gathered in the thatched hut of the Matsuba valley. The disciples, Nichiro, Kyoninbo, Sanmibo and others, the Shijo Kingo, Toki Jonin and others of supporters came, too. There is Kumao of the boy, too. After a long absence, a figure of Nichiren is looked like shining and they cannot call to him. Nichiren who has understood it said to them antecedently. “It's been along time. I am sorry that I made you worried. I thought that the earthquake was a opportunity and must inform Lord Kamakura by all means, and I had needed time, but the treatise was able to finally finish writing it. Come what may, I will never leave you”. “Priest, a rumor is getting abroad in the town about the writings of the priest”. Elder Nissho is restless, too. “There is a bad rumor between the groups of Nembutsu”. "They say, 'the priest is summoned to the Shogunate, and is closed in a dungeon and is banished to an island'". Nichiren smiles contrary to the worry of all members. “Even when Buddha was living, there was a persecution. It is the truth of the text of the Lotus Sutra. A persecution never avoids us to say nothing of the latter days of the Law. Now is time to rouse up by strong and energetic faiths”. Young disciples brighten eyes. But, the only one person, Sanmibo looked at him with the doubtful eyes. Nichiren called Hokibo then and smiled. “Please rejoice, everybody. This time one disciple joined me. Hokibo, please come here”. Hokibo stepped forward and put a hand on the floor. “I am Hokibo of Iwamoto Jitsusoji Temple. Fate wills it and, I became the disciple of the priest. Thanks in advance”. “I name thou Nikko by a Buddhist name, from today. The disciple of our sect adds the word of Nichi to all Buddhist name other than Buddhist priests of the child. After passing away of Nichiren, in future, understand it that you receive Law punishment of nature if did not add the Buddhist name of Nichi. Is this all right?”. The looks of the Hokibo were full of the joy that entered to the sect of Nichiren. “Everybody, we should not stay only in Kamakura now. I intend to widen propagation from now to Kyoto where Emperor and a court noble are. About this matter, you, Sanmibo”. “Thou, go to Kyoto, preach this doctrine and tell a court noble it. Even if there is much trouble because these are stories not to fit an ear, you should sow the seeds of the marvelous Law of Buddha. Please take this with you”. Nichiren gave copper money to Sanmibo. There was a hole in the center of the copper money, and one kan meant that it was 1,000 bunches by a string. The then money is all import from China. Although there was the product made in Japan too, it was bad in quality, anyone didn't pay attention to it. “These collect until now offerings and are the money which I saved. Please use this carefully. The crops do not grow by a drought this year. Be careful very much while on a journey”. Propagation of Kyoto was appointed by Nichiren, Sanmibo was full of sense of superiority. “I will convey the teaching of the Lotus Sutra by all means”. The Big Festival was held in the Kamakura Hachiman shrine in August in the Buno era first year (1260). 'Taiheigaku' of the Noh is held. The generalissimo for the subjugation of barbarians of the Kamakura Shogunate, the people of a noble, a court noble, and the samurai dress up. This generalissimo came from Kyoto, but he was a mere decoration. The status of the generalissimo is above the regent, but he does not have the political ability at all. The Hojo Shogunate invited the infant who was the blood relative of Yoritomo Minamoto as a general, from Kyoto to Kamakura, but they repeated what let him return to Kyoto when he reached the age of discretion. A generalissimo for the subjugation of barbarians was just a puppet of the Shogunate only in the name. On the other hand, the mansion of Tokiyori of same Kamakura have been guarded in a large number of samurais as usual. Tokiyori sits down on the tatami mat of the room. He became 33 years old. The documents are set on a desk in front, and a person in charge carries documents in sequence. Tokiyori saw the documents with a wrinkled brow. There are Tokisuke and Tokimune of brothers aside. Childishness was still left. Tokisuke became 11 years old, Tokimune became 9 years old. Furthermore, there are Yasumori Adachi, Yadoya Nyudo, Shigetoki Hojou. Here was the centrum of the Shogunate. Tokiyori watched documents for a while, but he threw it suddenly. “This is troublesome. Why I must take a look at such things? Nagatoki must do this work. Nagatoki is the regent now. Was I not a situation of the retired person?”. 30-year-old Yasumori soothed him. Yasumori is the third son of Yoshikage Adachi. He performed a meritorious deed on the battle with Miura clan, and he is the leader of the nonhereditary feudal lord. “You, the lord, is representative grandmaster of Hojo. Detail is work of Nagatoki, but it must be your work, about the serious problem”. "'How build the shogunate palace that fell down by an earthquake?' 'Who does fit for the military guard of Kyoto and Kamakura?'. Is there not the thing attracting interest elsewhere, indeed? There is a festival outside. It is the height of rite to thank to living creature, isn't it?". The lay priest Yadoya of the aide appeared forward. “Our lord, there is a thing rare here”. The lay priest Yadoya held out a scroll. The surface is written as 'The Treatise of Establishing the Correct Teachings for the Safety of the Nation'. “A priest of Kamakura called Nichiren is protesting the Shogunate”. Tokiyori looked away in disgust. “Well I know it. 'I want you to build a temple to pray for peace and security of our Hojo. I want money in connection with this affair. Please choose the when and where'. I have had enough of their talk”. “No, is not so. He tells that there is a method to prevent disasters such as extraordinary phenomena of Heaven and the famine of Japan of these past several years. All members stared at Yadoya. They tried all possible means. What should we do further? Tokiyori said what they wanted to say. “Hum, what is it? Does he say that we should collect rice paid as tax more and increase building and construction? We did our best. We have done everything we could do”. “No, he says there is the way of the solution else”. “Well, I cannot believe immediately. What is that way?”. “Nichiren tells there is the problem inside of Law of Buddha”. Shigetoki Hojo butted in. He is 63 years old at that time. Shigetoki of mature years got angry. “Stupid! The Shinto shrine and Buddhist temple stand side by side in this Japan. Is there the cause of the disaster inside of Buddha's Law? Does he say where it is?”. Yadoya said like a formal speech. “He says that there is the root of various evils in the Nembutsu sect of Buddhism”. All members were surprised. Shigetoki supporting Gokurakuji Temple yells threateningly. "What! Isn't it any kind of mistakes? As for the Nembutsu, both I and either the people in a country are believing. Does he say that it is the root of the evil? Yadoya, arrest the Buddhist priest, examine him in detail". “My uncle, please wait for a while. Yadoya, and, we must do what? Does he say that we should punish the priest of Nembutsu?”. “No, he says that we do not punish them and should stop an offering to”. “This is ridiculous! Anyone does do an offering to the temple of Nembutsu. It is a real irrational opinion”. “Let him alone. There is the strange person in the world, too. Even the people who says destroying our Shogunate are rampant in this Kamakura. If we mind such a thing one by one, a trouble would happen on politics. Besides he must be the vulgar Buddhist priest who is not famous”. Yadoya who prostrated himself raised a face. “There is a matter that I am wondering about. The priest called Nichiren tells that a bigger misfortune is caused if we do not accept this warning”. “A further misfortune. What is it?”. “The disaster of foreign invasion and the disaster of revolt from within”. All members buzzed with excitement. Hokibo was overwhelmed for Nichiren and hesitated for an instant, but barely spoke. “Does it mean that you should penalize Nembutsu sect to forbid it?”. “It is not so. It is to stop the offerings to Nenbutsu sect of Buddhism. A bigger evil happens if do not stop it in a hurry”. "To believe in Nembutsu invites an evil spirit, and the god of the protection go away." Hokibo has never heard such a tale at all. It is unbelievable immediately. “Why will it prevent an evil to stop an offering to a priest?”. “Even if we say about an evil, it is to be generated from a person after all. If we give an offering to a good person and stop it to the bad, disasters disappear, and peace reigns over the land. If it is so, one must stop the offering to a priest of the evil religion”. “What happens if do not stop an offering to a priest of Nembutsu? Do you say that a misfortune bigger than now is caused?”. Nichiren had the sutra in his hand. “If one continues slandering Law of Buddha and does not stop the evil doctrine, the sutra preaches it that seven great calamities would be generated in the country. There are five disasters in front of us. The calamity of disease and pestilence among the populace; the calamity of abnormal changes among the stars and constellations; the calamity of eclipses of the sun and moon; the calamity of unseasonable wind and rain; the calamity of a lacking rain. If you desire a secure land and wish to pray for peace in your present and future existence, you waste no time, and should immediately eliminate slanders. Why do I say this? It is because five of the seven disasters have already befallen, and the other two have yet to occur. The disaster of foreign invasion and the disaster of revolt from within. It is, so to speak, 'the disaster of warfare', 'the disaster of both invasion and plunder by foreign country', 'the disaster of bandits to invade from the four directions'. What would you do if the disasters which was left occur simultaneously side by side by a fault of the evil Law? The emperor rules the nation by keeping order, the people possess their farms and keep the world. But if marauders come from other regions to invade the nation, or if revolt breaks out within the domain, people's farms are plundered, will they not be shocked? Will they not panic? If the nation is lost and homes are destroyed, where will you flee? If you truly desire your own peace and security, should you not first pray for peace of the every direction?”. Hokibo put his hand to the floor and gave a voice as soon as sermon of Nichiren was finished. “Priest Nichiren, I am still clumsy greenhorns, but please treat me as a disciple!”. Hokibo felt intuitionally that if he approached this person, he could walk a way to right Buddha. Words fell from his lips at a moment when he thought so. The answers of Nichiren overflowed in affection to be superior to his parent. “There are already disciples to me, but they make a great effort for even a meal of everyday. If it is good, you think me to be father, and let's train ourself together throughout the life”. “I live in this temple. I will take care not to inconvenience you. Please add me to one of your disciples”. Nichiren nodded twice and thrice powerfully while having a smile. “Hokibo is my disciple from today. Because it is a custom to add the word of Nichi to the name to my disciple, I will think about the name that is good for Hokibo”. Hokibo was surprised that Nichiren permitted becoming a disciple too easily, furthermore was surprised by receiving the Buddhist name of the word of Nichi. The Hokibo put enough his hands on the floor and left the room of Nichiren. Although Nichiren met Hokibo on February of the second year of Shoka era ( 1258 ), father Myonichi of Nichiren had passed away strangely on February 14th. Nichiren who hurried a national protest to the Kamakura Shogunate did not come back to the hometown. But he writes it as 'February 14th in Shoka era' in the end of "the Gist of the Sacred Teachings of the Buddha's Lifetime" written at this time. It is strongly guessed that it is a reason mourning over death of father. He kept his sorrow of the death of father, and Nichiren further continued writing. 'The treatise of establishing the correct teachings for the safety of the nation' is the national treasure now, is starting from "a traveler arrived and lamented to the host". A rough copy was written it in this Iwamoto Jitsusoji Temple. Nichiren intended to give to Tokiyori Hojou who was a real ruler of the Shogunate. Tokiyori became a priest as a common person, and himself said Saimyoji Nyudo and handed over the regent's post to Hojo Nagatoki of brothers-in-law, but Tokiyori still had the real power at the Kamakura Shogunate in those days. Must hurry. The great disaster continued. Nichiren writes down the situation of the disaster of Kamakura of those days with "the Post script to 'Establishing the correct teachings for the peace of the land'” as follows. “On the twenty-third day of August the first year of the Shoka era (1257), among the hour of the dog and the boar (around 9:00 p.m.), there occurred an earthquake of unprecedented magnitude. In the second year of the same era, on the first day of August, there was a great storm. In the first year of the Shogen era(1259), the great pestilence has broken out, and throughout the four seasons of the year after, the great pestilence continued without abating. By this time more than half the people of the nation had been invited from death. The ruler of the country who was alarmed at this state of affairs commanded to the people of Buddhism and the non-Buddhist that various prayers be offered. These, however, failed to produce even the slightest effect. On the contrary, famine and pestilence raged more fiercely than ever. I, Nichiren, observing this state of worldly affairs, thought about almost all the Buddhist sutra. There I discovered the reason why these prayers are without effect and on the contrary actually make the situation worse. At last, I wrote one dissertation out of necessity and named it `The Treatise of Establishing the Correct Teachings for the Safety of the Nation'". To be continued to 'to the Nation Remonstrate, and the Persecution of Matsuba Valley'.